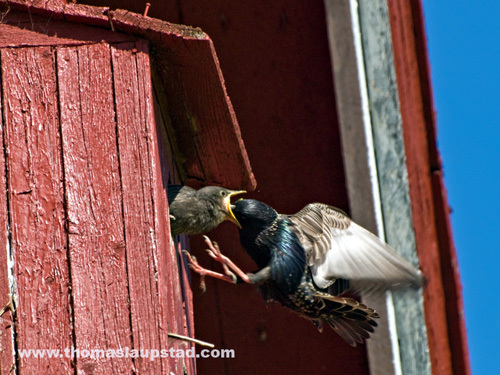 The starling couple that I photographed and blogged about in this post laid eggs in the birdhouse on our barn this year too. 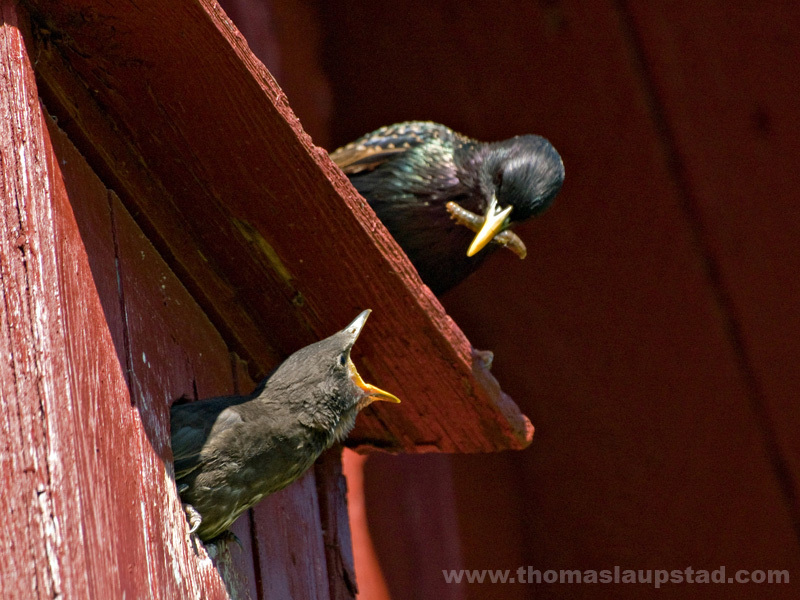 Here is some pictures that of the starlings feeding their young. Taken with Olympus E500 digital camera June 6th 2008. Click image for larger view. Ahh, food! The parent really makes sure that the young starling is swallowing her/his food. 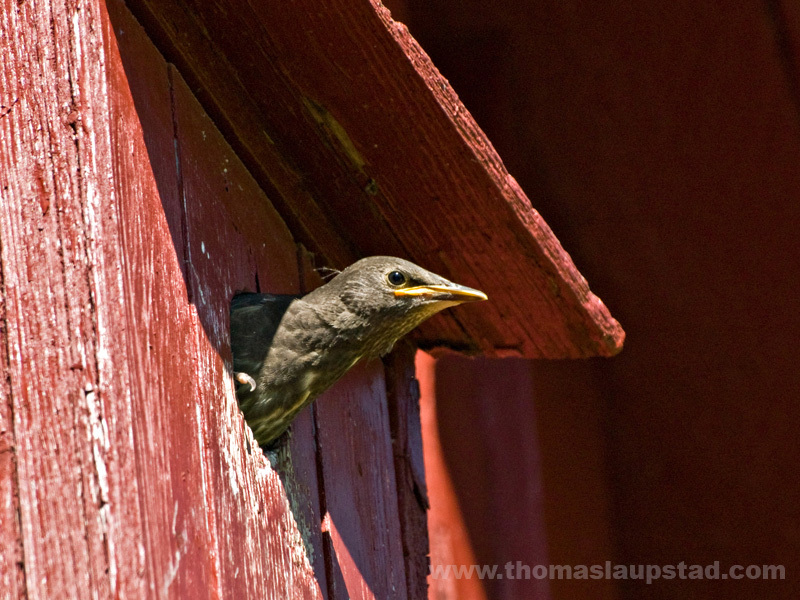 The young starling waits for more bugs to arrive. If you click on the image to view it large you can see a cute little feather on the head of the young starling. I wonder how the other young birds are able to get food when this one is blocking their access to feasting on bugs.. 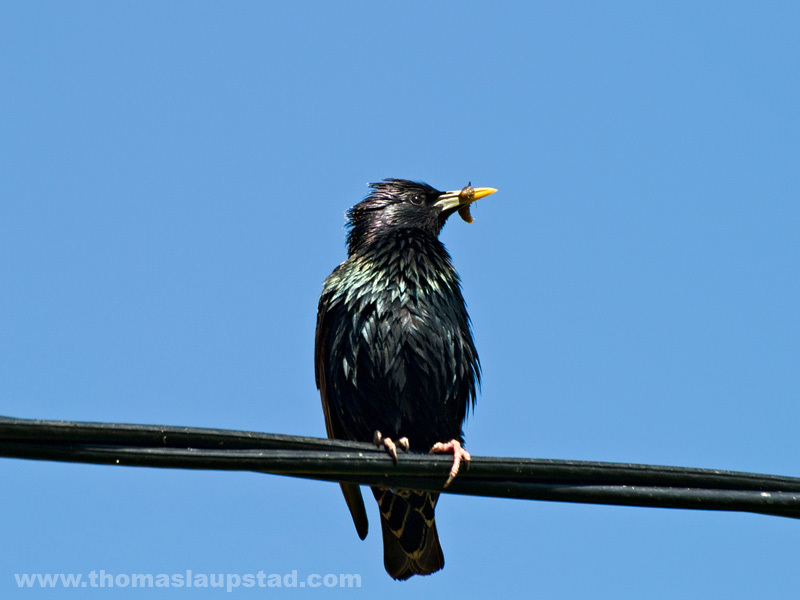 This parent starling seemed a bit worried about my presence, but a few moments later it fed the larvae to a hungry young starling. Trying to reach each other.. The young birds are now out of the birdhouse and the starling couple lays on a second batch of eggs. This is a terrific series, Thomas. That second shot is truly amazing. Interesting that these starlings have two clutches of eggs in one season. This is a great series with great photos. Hi Jungl, very well caught. You froze some magical moments. Very impressive nature shots. Bravo… great shots… The 2nd is just Awesome !! Oh, wow. That’s absolutely amazing. The baby bird looks larger than the mother bird. I love to watch the baby birds get fed. It is just so sweet. Thank you for sharing this. What great action photos! I just love how you’ve captured a bit of nature that otherwise is so quick and fleeting. Thanks for showing these. They’re not only fascinating photographs, they make me feel closer to the outside world. What do you call an infant bird, anyway? Anyway, I’m familiar with that look on its face. I get that look when I come near my baby with a bottle. Absolutely stunning photos Thomas! You did a great job with this. Great shot – I know how difficult that is! WOW!!! Those are amazing shots. 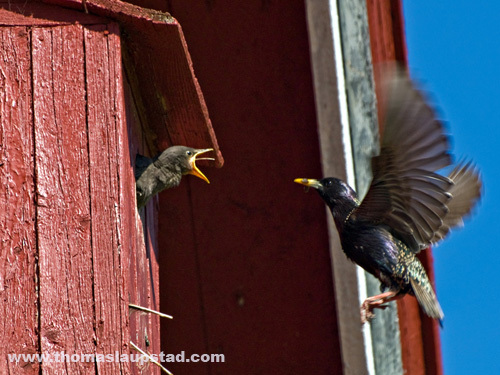 So nice these pictures of bird feeding. Il like your site very much! Now that’s a great set of shots! I love the first one! The look on the baby bird’s face is absolutely priceless. These are fantastic nature action photographs. They are extremely difficult to do successfully, but you got some great captures. Good job!